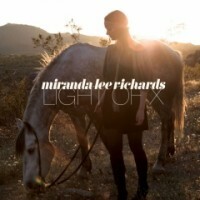 Maybe you can’t judge a book by its cover, but you can definitely get a good feel for Light of X, the sophomore album by Los Angeles-based singer/songwriter Miranda Lee Richards, just by looking at the jewel case. A hippie headscarf-draped Richards, standing aside a horse, looks away from both the observer and the sunrise – an image not unlike the songs of Light of X: slightly sunny with a hint of the late 60s and early 70s, and always looking inward before looking onward. That flower power/AM pop split creates an informal division within X, the dreamy ballads on one side and the mid-tempo pop stabs on the other. Where many an artist has been burned by excelling in one but not the other, Richards’ main problem is that she can do both quite well, although the occasional missteps in her pop songs tend to magnify themselves and make the slow numbers look better in comparison. The near-rocking dirge of “Early November” succeeds by fusing mid-90s shoegazer rock with a remarkably complementary hint of country, but the bouncy optimism of “Olive Tree” finds itself bogged down by its teenage-girl-diary lyrics. At the same time, X and Richards both shine brightest as the songs turn down in mood and tempo. “Lifeboat,” easily the album’s finest track, lets Richards’ reverb-soaked alto echo through endless space over dual pedal steel guitars and a wash of psychedelic electrics. Richards’ reassuring vocals deliver their strange, semi-lucid message through a verse structure that has entirely evolved by the third time around, but the stellar arrangement keeps the whole thing from devolving into a prog-folk nightmare and instead delivers nothing less than a four-minute masterpiece. More than anywhere else, Light of X can be summed up by its final two tracks. The listed closer, “Last Days of Summer,” drapes Richards’ vocals over what can only be described as an achingly beautiful piano and string arrangement. Lyrically, “Last Days of Summer” more closely resembles free-association Beat poetry than any sort of recognizable lyrical pattern or motif, but Richards’ delicate delivery conveys the song’s sense of confusion and loss in the face of change better than any words ever could. But the album actually concludes with “Oddity,” a hidden track emerging from the silence following “Last Days.” Over an unexpectedly aggressive 5/4 pattern, Richards comes out in full-on spoken word mode with allusions to fire and ice and a journey only slightly as meaningless as everything else, man. With so much of Light of X floating in the sunny desert sky, the jarring end forms a strange but perfect synopsis of the album: the rocking moments may not feel quite right, but the breathy ballads surrounding them make that discomfort very easy to look past.